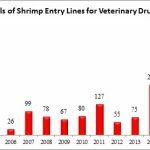 The U.S. Food and Drug Administration (FDA) reports that, in August, 6 out of the 107 (5.6%) total seafood entry line refusals were of shrimp for reasons related to banned antibiotics. 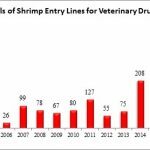 Edhayam Frozen Foods PVT Ltd. (India), a company that has been added to both Import Alert 16-129 (“Detention Without Physical Examination of Seafood Products Due to Nitrofurans”) on July 27, 2018 and Import Alert 16-127 (“Detention Without Physical Examination of Crustaceans Due to Chloramphenicol”) on July 24, 2018, had one entry line refused for shrimp contaminated with chloramphenicol and deemed poisonous by the Division of Southwest Imports on August 2, 2018. 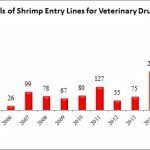 Further, the FDA reported refusing another two entry lines of shrimp for salmonella in August, both from India. The FDA has now refused 62 entry lines of shrimp for salmonella through the first eight months of 2018, of which the vast majority originate from India.